This book made me laugh out loud so many times I got embarrassed at school. A lot. Just sitting there, peacefully reading/doing homework, and then I start laughing and everyone turns to stare at me. I don't care, though—makes for a good book! The very first page of the book made me start cracking up, so I'm glad I grabbed it when I saw it. Evie is definitely different from a lot of protagonists I've read for. She's one of the first who has been a total badass girly-girl who loves pink and high-heeled boots. And even though she doesn't take crap from anyone, she has sympathy for the paranormals she tags as well as a cute disposition that made me want to be best friends with her ("Look at me, aren't I cute?"). I adored the names of the chapters, how they're all puns and almost all humorous. It's almost reminiscent of dark humor that Markus Zusak uses, consoling the reader though there's nothing funny about the chapter. All of the characters are different and likeable (aside from Reth and Vivian, I mean) and they each have some sort of quality that makes you curious about them. I'm not sure what to think about Lend. I honestly don't feel like I got a whole lot of information about him. I did later in the book, of course, but something about him just makes me feel like Evie's letting her feelings for him rush a little quickly. But I prefer Lend over Reth, just so we're clear. xD Lend's power is definitely unique, and left me curious for a while until we figured out what in the world it was. Onto Reth's arc with Evie, now that was intriguing. But I did get kind of annoyed with Evie there—even it if was for the plot. "I need you!" Why would you yell that? Moment of panic, I assume, and since there was a past relationship between them, but she's always going on about how dangerous the faeries are and how they twist words all the time. The minute I read that, I knew she was in for trouble... But I'll let it slide. She was about to get sucked dry, I probably would have done something along the same lines. I'll make a paragraph about why this got four stars instead of five, though. Evie went through a number of things in this book that she chose not to confide in Raquel about, and when she did confide to Raquel about it. Like after Reth's first 'attack' and he drained part of his soul into her (I assume it was his), and her wrist and chest were glowing? Raquel saw it happen, but she couldn't see the glow. But, still—why didn't Evie tell her? Maybe Raquel wouldn't have believed her, but come on!! I would have told her, no matter what it would've meant for me. Regarding a faerie like Reth, I wouldn't have minded a bit more protection. But I keep putting this into what I would have done. Maybe that's just Evie, but I still think it was strange. That's pretty much the only reason this was four out of five stars. Otherwise, the plot had me in for a loop and all of the characters caught my interest and concerns. Even Vivian, seeing how lonely she was, made me feel for her. Kiersten White did an amazing job of representing all the characters and keeping you curious, especially at the end of the book. I'm eagerly awaiting a chance to grab Supernaturally, because I really want to know what Reth meant by "the right door" and what he plans to do. It's concerning, and exciting. I'll halt the review there. 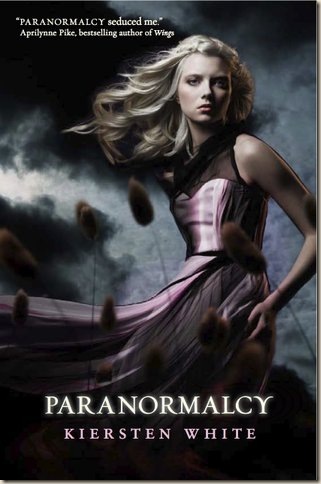 I loved Paranormalcy just as much as Evie loves pink! I hope Lish makes some sort of surprise appearances, somehow, in the next book. I liked the bleeping too much. ): It seems like 7-8 paragraphs is the normal length for any review I make, haha... anyway, loved this book! Now, I'll probably be waiting until Christmas to read Supernaturally. Darn.